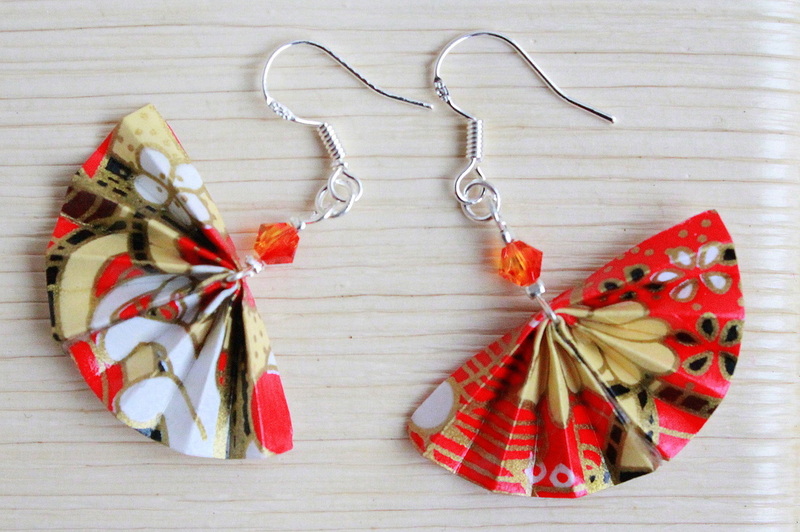 These beautiful Oriental Mini Fan origami earrings are handmade with Washi Paper and coated with water resistant polish. 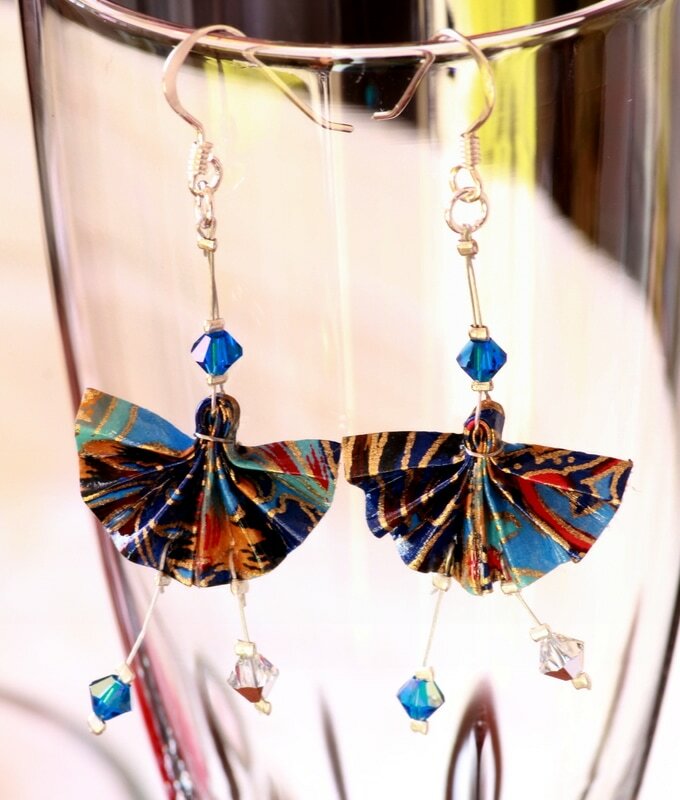 It is assembled with Sterling Silver and Swarovski Crystals on each pair. Fans are traditionally symbolises happiness and good fortune. 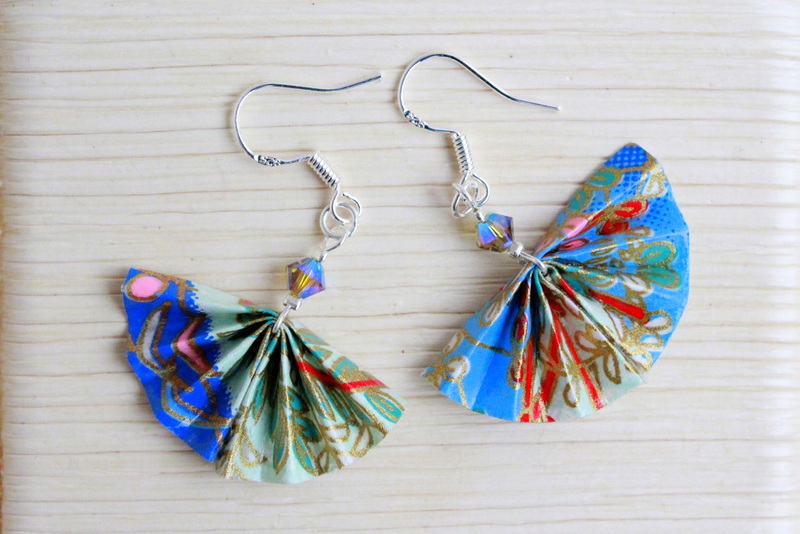 Patterns may be slightly different from photo. Patterns may be slightly different from photo. 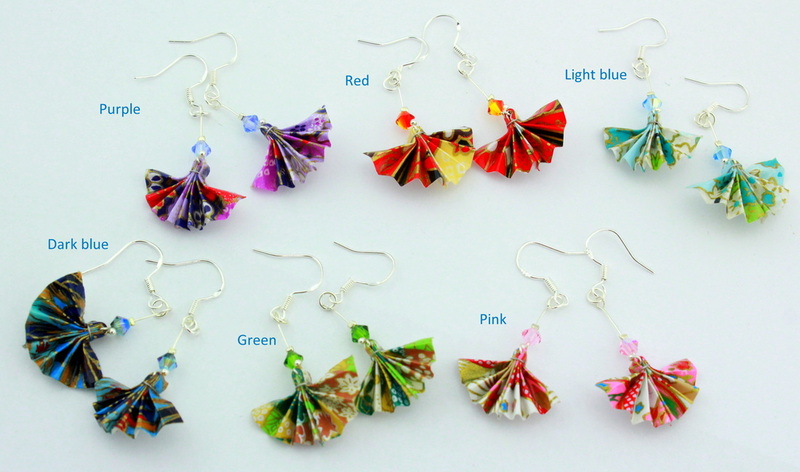 Custom made order also available please contact Miss Chopsticks. 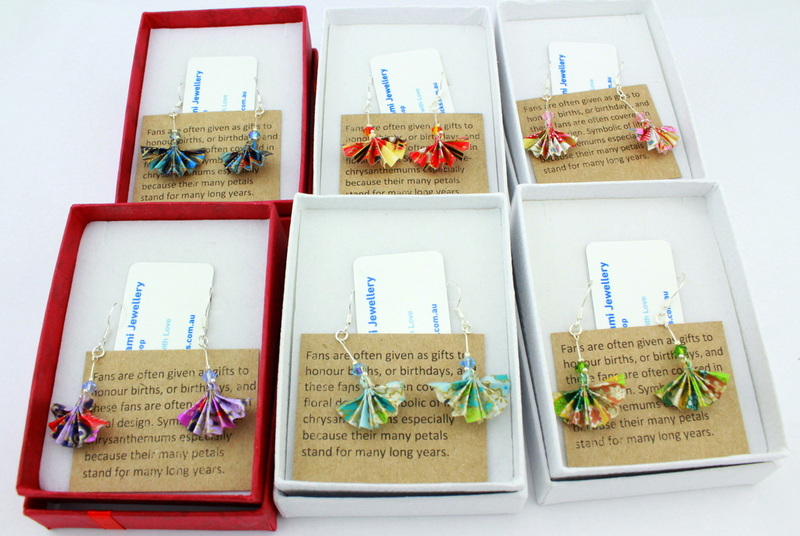 These gorgeous mini fan origami earrings are handcrafted with Swarovski crystal s and attached with sterling silver also coated with strong water resistant lacquer gives a long lasting effect. 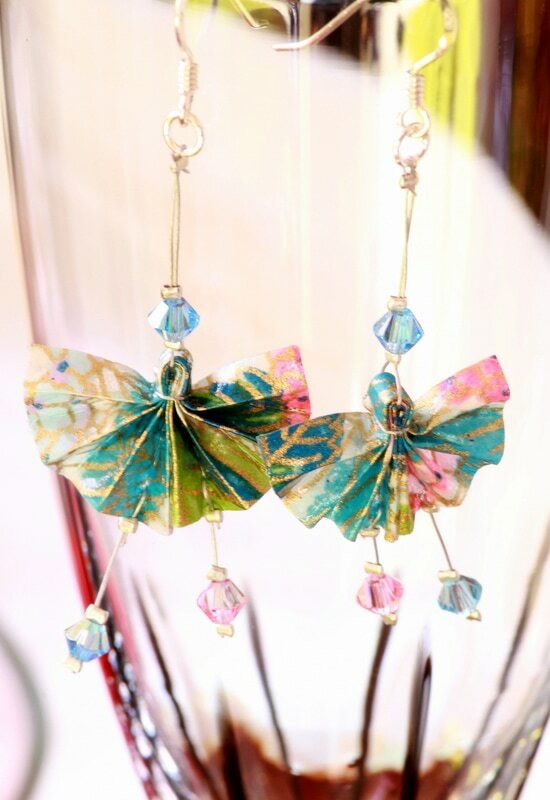 Fans are traditionally symbolises happiness and good fortune. Patterns may be slightly different from photo. 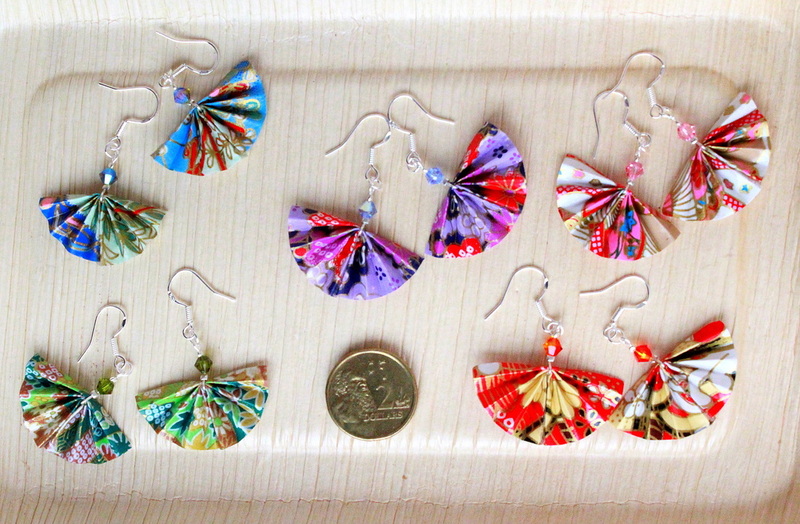 Patterns may be slightly different from photo. Custom made order also available please contact Miss Chopsticks. Mini Fan Origami Earrings with Swarovski Cyrstal Pendants-Sterling Silver hooks. 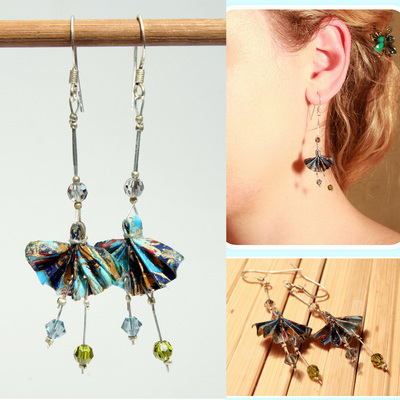 These gorgeous mini fan origami earrings are handcrafted with Swarovski crystal pendants, attached with sterling silver hooks and coated with strong water resistant lacquer gives a long lasting effect. 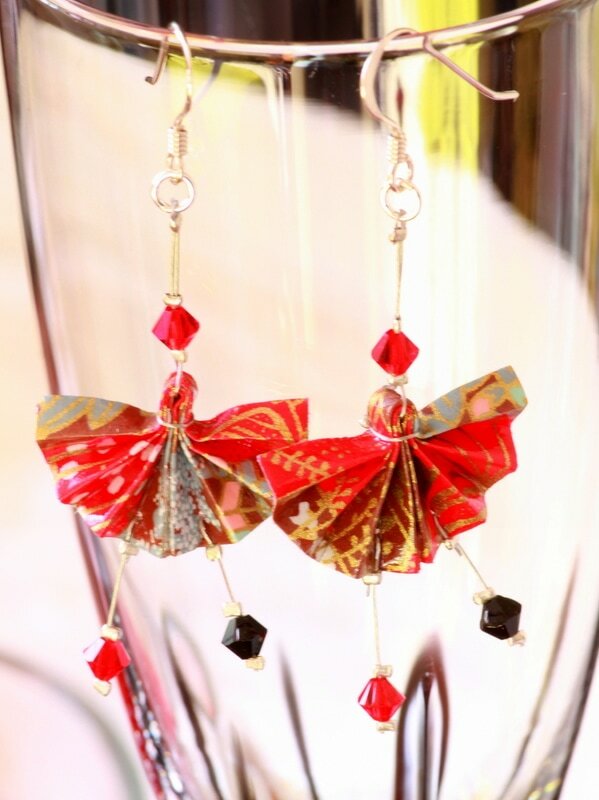 Fans are traditionally symbolises happiness and good fortune. Patterns may be slightly different from photo. Custom made order also available please contact Miss Chopsticks. ﻿﻿Fans are often given as gifts to honour births, or birthdays, and these fans are often covered in floral design. Symbolic of life-chrysanthemums especially because their many petals stand for many long years. Irresistible handmade little dancer fan origami earrings. 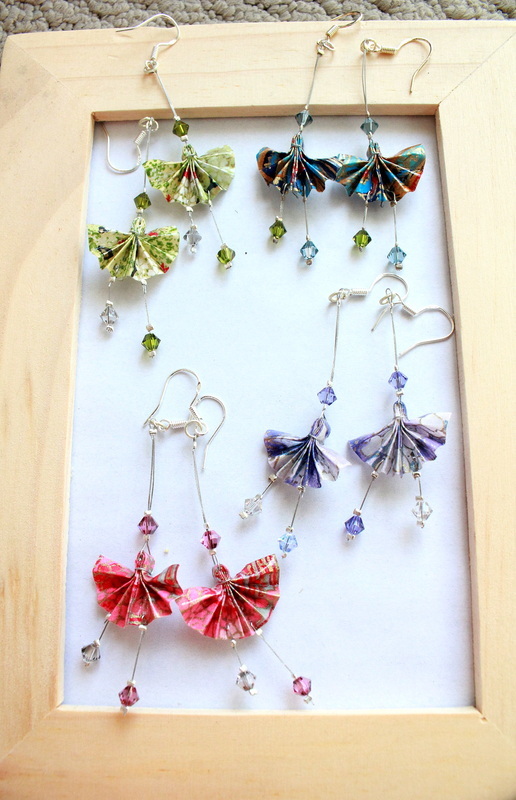 Made from “Washi” paper attached with 3 Swarovski crystal pendants on each piece and attached with sterling silver hooks. The dancer brings out a very famine and elegant look. 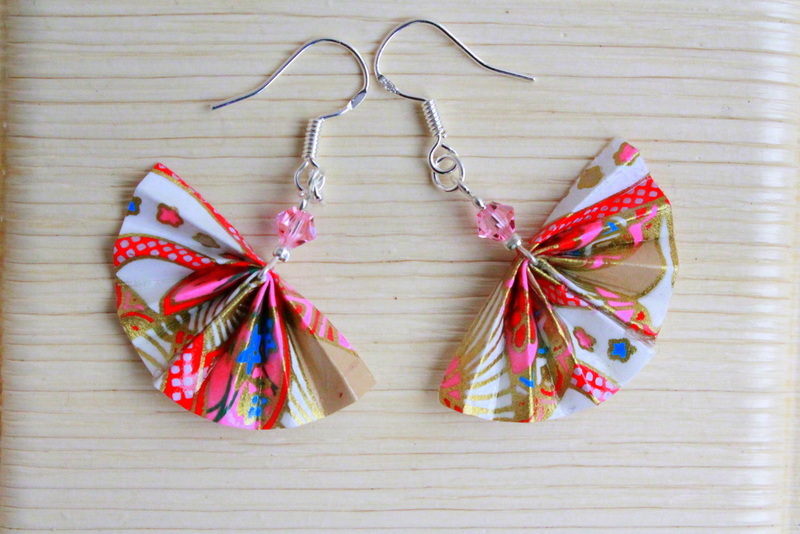 Patterns may be slightly different from photo. 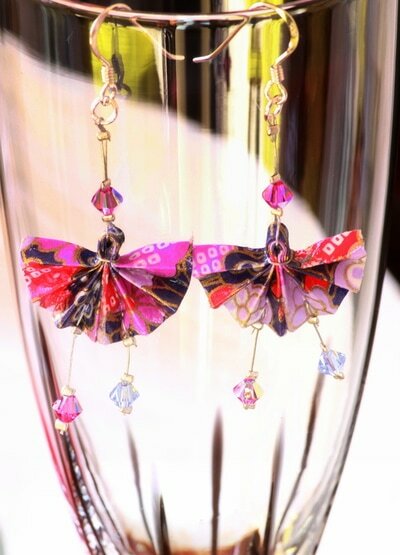 Custom made order also available please contact Miss Chopsticks. 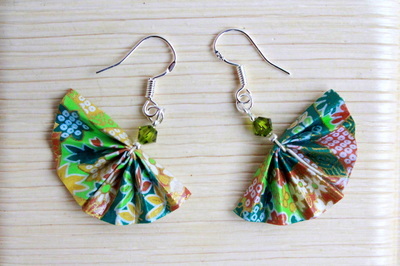 Swirl Mini Fan Origami Earrings -Sterling silver hooks. 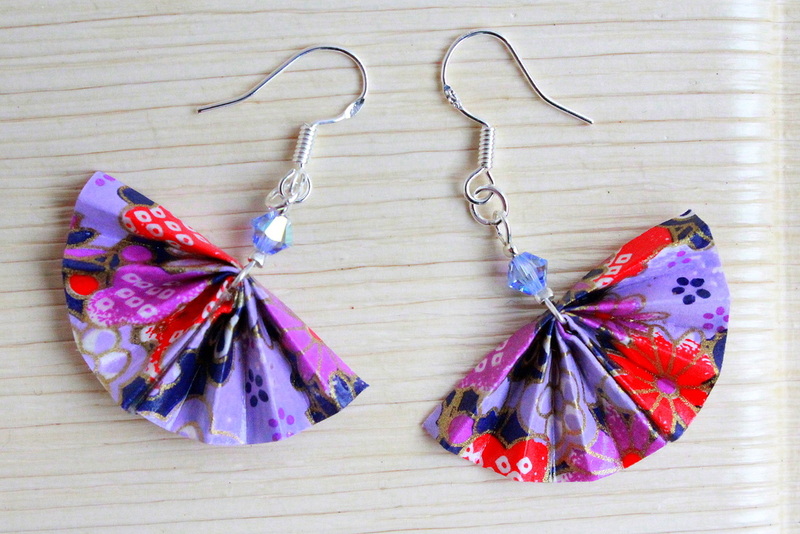 Beautiful Mini swirl fan origami earring with Swarovski crystal pendant. Each handmade origami are made from washi paper and coated with water resistant lacquer gives a long lasting glow in the sunlight and sophisticated sparkle in the night lightings. 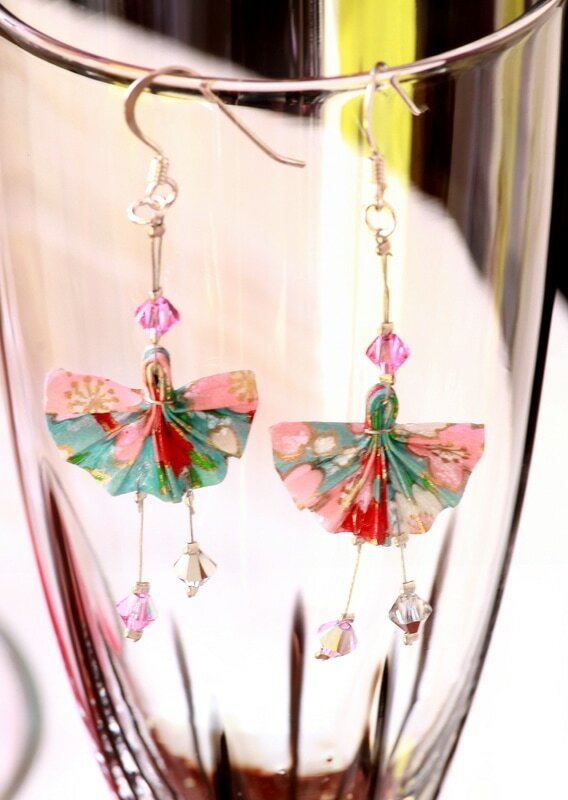 Unique gift to your love one or spoil yourself. Patterns may be slightly different from photo. 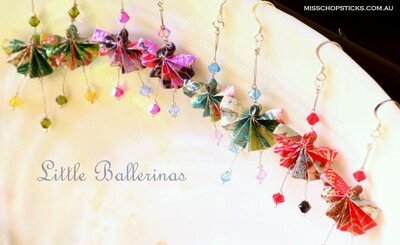 Custom made order also available please contact Miss Chopsticks.